Jason Berry, who broke the Fr. Maciel story more than a decade ago, has a bombshell account of how that polymorphously perverse sociopath bought influence and protection by spreading his money around the Vatican. As Pope John Paul II slid into senility, and as the organization he headed slid into increasingly reactionary disarray under the control of the Ratzinger faction, it was hard to avoid noticing the parallel between John Paul and his great historical enemy, Leonid Brezhnev. 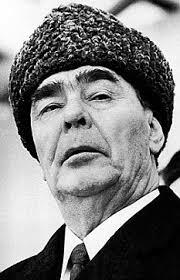 Â Each would have left a sounder institution behind him if the Grim Reaper had come a decade sooner; in Brezhnev’s case at least, damage to the institution was benefit to the world. At the end, there was even a certain physical resemblance. Jason Berry’s account in the National Catholic Reporter of the web of corruption spun by Fr. Maciel and his Legionaries of Christ is hair-raising. Â It appears that Fr. Maciel procured his infuence in the Curia the old-fashioned way, with envelopes full of cash. Ratzinger is the one Vatican official named in the story as having refused the money, though he must have known that many of his Curial colleagues were on the take. Â (It’s not clear that any rules were broken, because it doesn’t appear that there were any rules.) Â Others in the Curia who did take the money were responsible for giving Maciel what he most wanted: Â a constitution for his order including the Private Vows, binding each member not to criticize the founder and to report on criticism by anyone else. After years of delay Ratzinger finally bucked the boss by starting an investigation into Maciels sexual (as opposed to financial) misdeeds; in addition to abusing young teen and pre-teen boys in his seminaries, Maciel fathered children with at least two women. Â As Pope Benedict, Ratzinger sent Maciel into retirement, though of course without providing the faithful or Fr. Maciel’s victims with any sort of accounting of his misdeeds. Another sort of accounting may be even harder to generate. I’m deeply skeptical of financial numbers thrown around by reporters, but if the Legion really has anything like a $650 million annual budget or a $30 billion endowment, it’s going to take approximately forever to trace the flows; it’s not entirely clear whether the Vatican is in a legal position to exert control over those funds, even if it wants to. If money from the Legion made its way into right-wing American politics, we’re likely never to know about it, any more than we know about exactly how John Paul funneled Church money to Solidarity. Â This wouldn’t be the first time that shady maneuvers justified at a moment of crisis and for a good cause got to be a bad organizational habit. More than anything else this makes me think of the decadent era of the roman empire. Next Next post: How about the right to unionize?